Writers are not always the “lead partner” when they work with photographers, but if you are the point person for a project, you should ready yourself to collaborate successfully so that another joint project will follow. 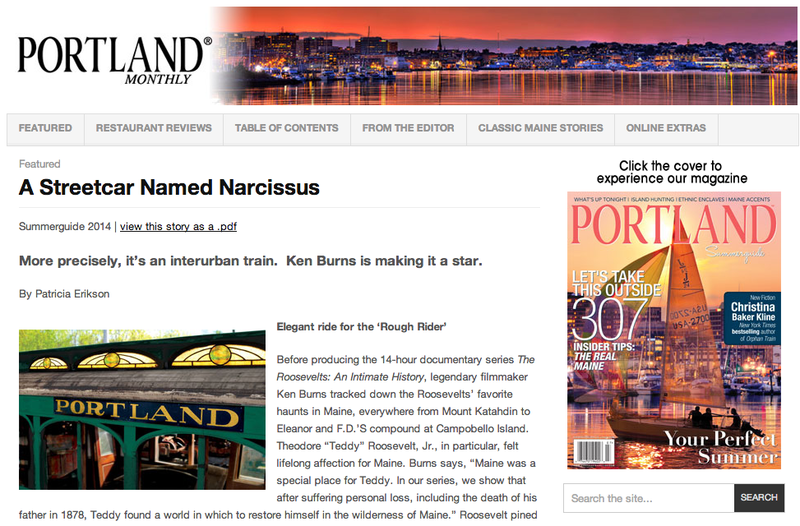 Because the Summer Guide issue of Portland Monthly Magazine published my “A Streetcar Named Narcissus” — an article named after a vintage, interurban electric coach at the Seashore Trolley Museum in Kennebunkport, I’ll use my collaboration with photographer and filmmaker Alban Maino as an example. The Narcissus–once a high-speed engineering marvel–bears the distinction of having transported Theodore Roosevelt Jr. between Lewiston and Portland, Maine on August 18, 1914. Ken Burns’ newest documentary series The Roosevelts: An Intimate History has turned the grand lady Narcissus into a bit of a celebrity, prompting me to ask my friend, Alban Maino of Dreamland Medias, to help me document her painstaking restoration. Here are some takeaway tips from that project. Tip #1: Plan for the unique conditions of your site. I shouldn’t say “this was an unusual shoot,” because the fact is, every photo shoot is unique. For a writer to lead a successful collaboration, they need to learn as much as possible about the conditions under which the photographer must work and PLAN AHEAD. The idiosyncracies of the location might require particular accommodations of footwear, clothing, photo equipment, or even mental preparation. The more the photographer knows, the more prepared he or she can be. Tip #2: Do not underestimate time. In order to photograph the Narcissus in natural light, I worked with Narcissus Project Manager Phil Morse to have the Narcissus untarped so that it was exposed to natural light. 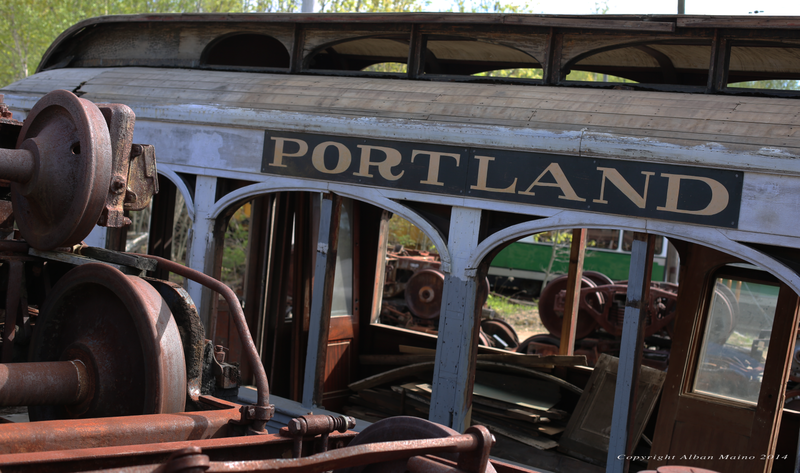 A team of volunteers labored for hours to uncover the vintage interurban vehicle; consequently, our photoshoot needed to coordinate precisely with the volunteers’ efforts, as well as align with good weather. Tip #3: Be a safety nut. The physical conditions of photographing the Narcissus were demanding physically and slowed the project down. 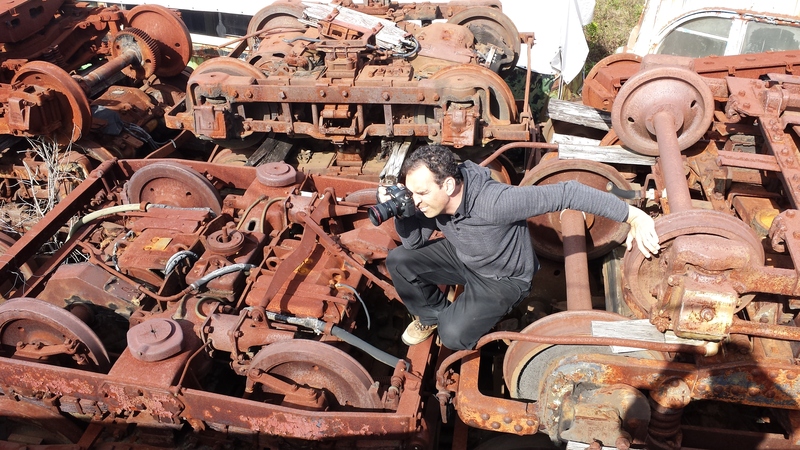 In order to get the frames that he wanted, Alban scampered more than twenty feet up onto the salvage “trucks” or undercarriages of trolleys nearby. The dramatic photo of him above – dubbed “the crouching tiger” by Phil Morse – illustrates how conditions must be navigated carefully and safely. While the photographer is looking through his lens, you can help make sure that he doesn’t step into harm’s way. 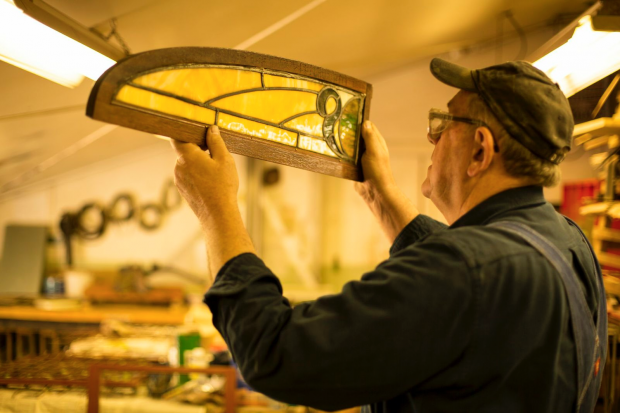 Former President Theodore Roosevelt would have gazed at the passing Maine landscape through the Narcissus’ stained glass windows – framed by mahogany paneling with gilded striping and inlaid with holly and ebony – now under restoration (copyright Alban Maino). Peaks Island Press offers behind-the-scenes glimpses of a vibrant, literary community perched on Peaks Island, two miles off the coast of the beautiful and award-winning city of Portland, Maine. If you haven’t already, you may subscribe in the upper right corner athttp://www.peaksislandpress.com.